I love exploring different ways to layer and manipulate paint on furniture. I have this thing about combining greens and blues and figuring out ways to bring this color combination to life. 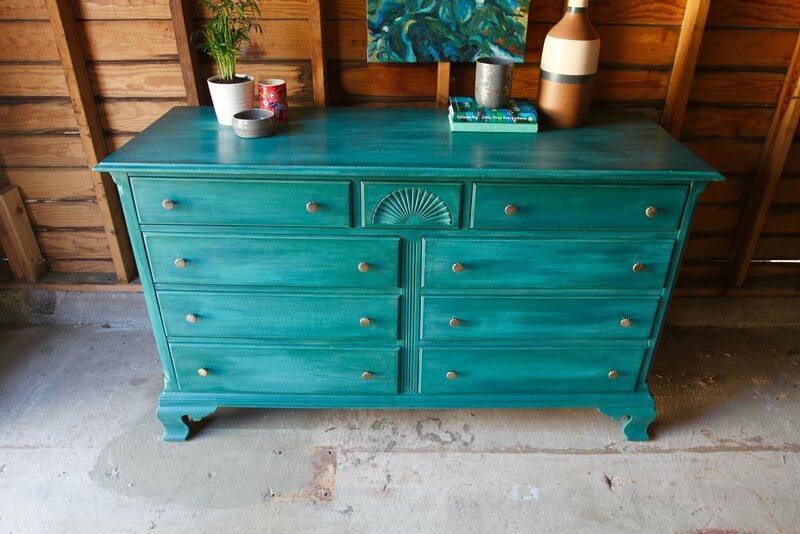 I bought this piece, a vintage mahogany dresser, from a neighbor who had meant for it to be her own project, but a move to California meant I got to take this on as my own. 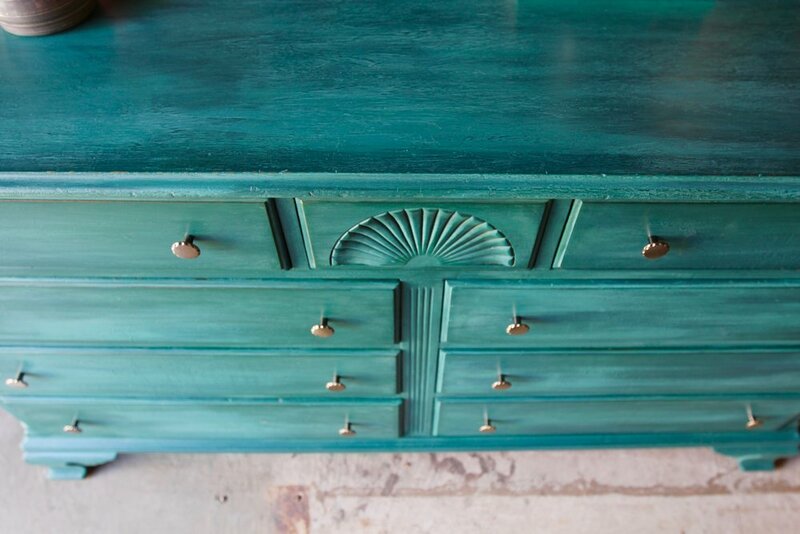 Other than the fan detail at the center of it and a bit of fluting along the two sides, this dresser is fairly simple in style. I knew it would need a more creative finish to really allow it to shine. 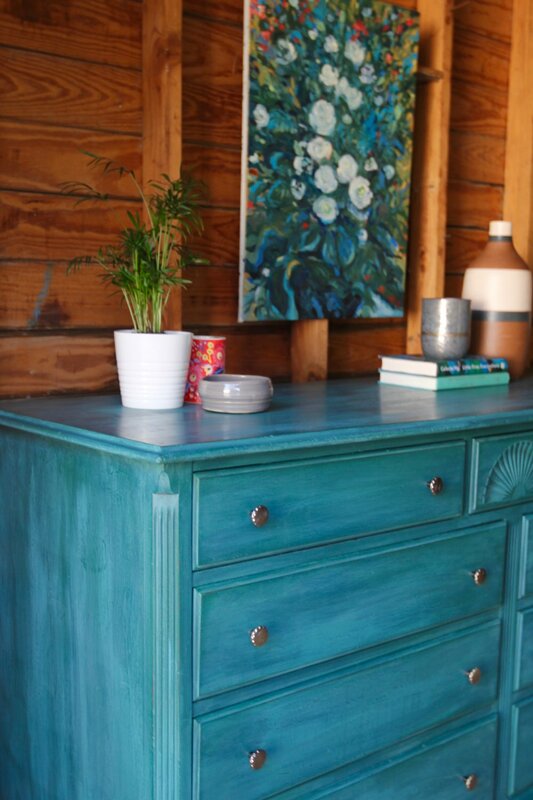 I started off by painting the entire piece in Annie Sloan’s Amsterdam Green. I like to start with the darkest color as my base and then add lighter shades on top. This isn’t essential, but I just find it works best when I’m trying to achieve this layered effect. To create a sense of depth to the flat surfaces, I mixed up varying shades of teal, combining Annie Sloan’s Napoleonic Blue with Amsterdam Green and adding Pure White to create lighter shades. I quickly painted one of the shades of teal haphazardly all over the piece and immediately went over it again in a lighter shade of teal, making sure not to fully combine the two colors. After letting it dry for just a few minutes [no more than 10], I started to spray the dresser with water with one hand and brushing over the piece with the other hand. Sometimes I’d let the drips stay, mostly on the drawer fronts, but I tried to avoid any sort of uniformity to how I did this. When it looks too forced, I feel like the paint finish loses that unique patina. Sometimes I won’t like how a certain area looks, and I’ll just paint right over it and start again. It’s a process and takes extra time to dry with the addition of water, but I just cant get enough of the end result! 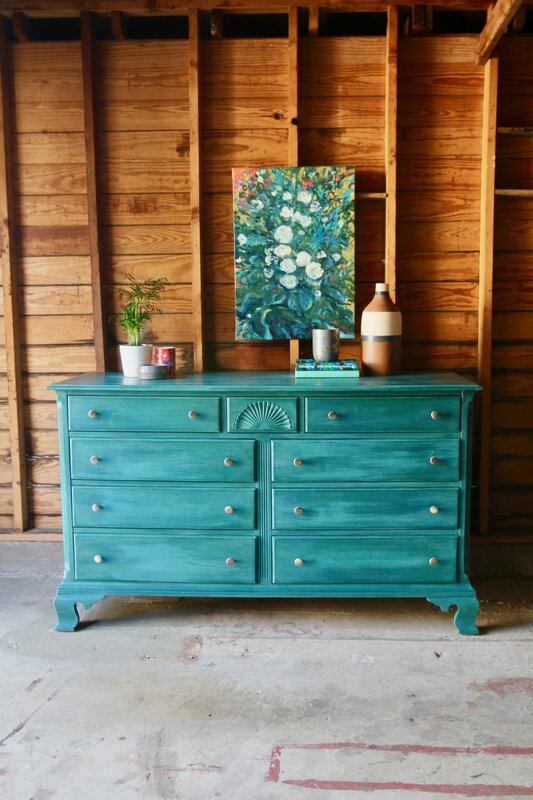 I’m really enjoying getting more creative with my painting process, and I’m desperate to get my hands on another dresser to use this technique on! Which one will be next?! If you have a piece that needs painting or are on the hunt for something specific, contact me and I’ll help create something beautiful for you! Anytime I can get a deal on a mid century piece, I jump on the chance. 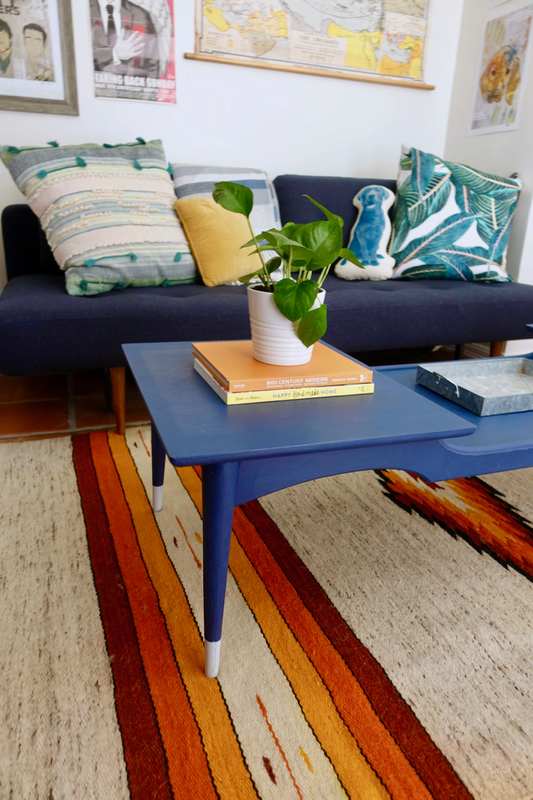 Deals often come with some issues, but other than some wobbly legs and a laminate top, this coffee table was ready for a facelift. I opted to use one of my favorite blues, Annie Sloan’s Napoleonic Blue. It’s as close to a primary blue as I can get, only a bit deeper. Mid Century does best with a clean, simple finish and I kept it that way, only adding a touch of detail to the tapered feet with a light gray paint. I love the low, long silhouette of this piece, and how the brighter pop of blue balances with the deeper shade of my futon. Now all I have to do is hunt down more mid century projects to geek out on so I can be willing to part ways with this beauty! 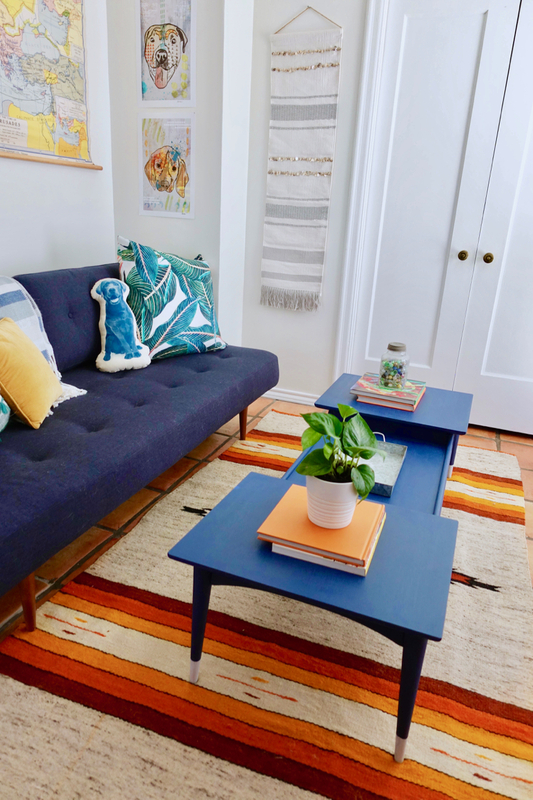 Unless you’re an extreme minimalist, adding storage to your home in any way possible seems like something everyone could use. At the start of the year, it seems like everyone in my life is trying to reorganize their homes. I love having a zone for certain tasks in the house: coffee supplies, cleaning tools, and in this case, my wine and bar necessities. Having my wine and cocktail glasses, all the bottles and even my books on cocktail making and wine all stored in one place makes it effortless to have an impromptu gathering at the house or just know where to head to when you’re in desperate need for a drink after a long day. 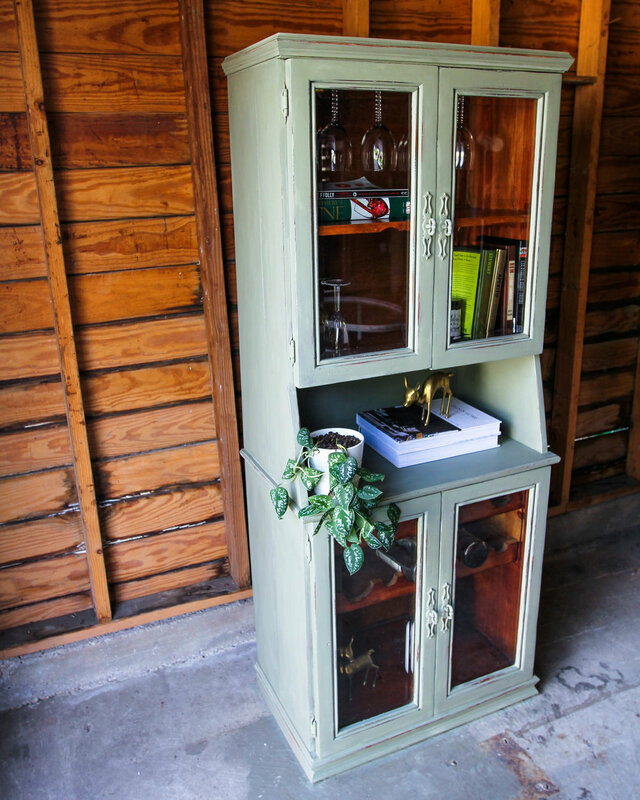 I really love this cabinet I painted in Annie Sloan’s Chateau Gray. This paint color is gorgeous in person. It’s a subtle mix of gray with a hint of sage green. I distressed it to reveal the original wood tone, allowing the exterior to tie in with the unpainted interior. All painting aside, I’m really just so impressed the storage capabilities of this cabinet. The lower cabinet stores up to 14 bottles, and has a lower shelf to store taller objects or additional bottles. The middle area is open and is perfect for displaying books, plants or other styling objects. If you’re using this as a liquor cabinet, it’s the perfect spot to place all your bitters and bar tools. The upper area stores up to 18 wine glasses and has two shelves for storing additional glassware, small tasting plates, or any other drink supplies. I love pieces like this that can maximize storage while still being visually beautiful in a space. I’ll be adding this piece to my website shop soon! I saw this table at my local Habitat for Humanity ReStore and it was an easy purchase. Though I don’t really implement the Hollywood Regency style in my own personal design, I see bits of it everywhere and I have a secret love for all things bamboo. This table was a glossy orange-toned wood bamboo that I couldn’t see working for me or any of my clients, but I wanted the bamboo details of this piece to come to the forefront. Going with a dark color wasn’t going to cut it. All those curves would be muted by the depths of a deeper shade, so I knew white was where I was going to take this piece. I wanted to make it feel more ‘California’ or beach-y, or in this case, poolside appropriate. 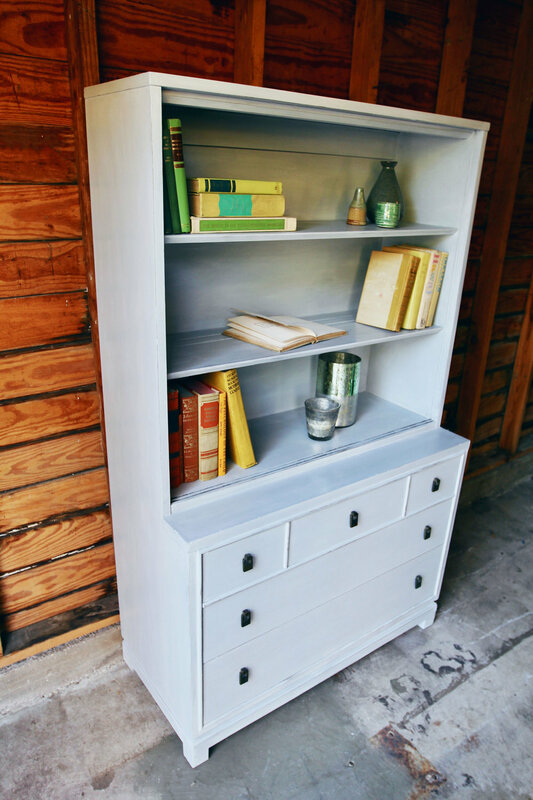 I grabbed a bristly round paint brush [one of Annie Sloan’s] and ever so slightly dipped it in Pure White chalk paint. In a weird version of musical chairs for one, I’d quickly paint the piece as I moved in circles around the table. It looked comical, but working this way ensured I didn’t miss a single curve on the piece [and with bamboo, there are seemingly infinite curves]. I’d then flip the table over, work on the legs in the same orbiting pattern. The finished product has a weathered, beach inspired vibe, resembling something similar to driftwood. The table has an airy lightness to it, which is further achieved with its glass top. There isn’t a single harsh edge on it, other than the striations from the dry brushing technique. 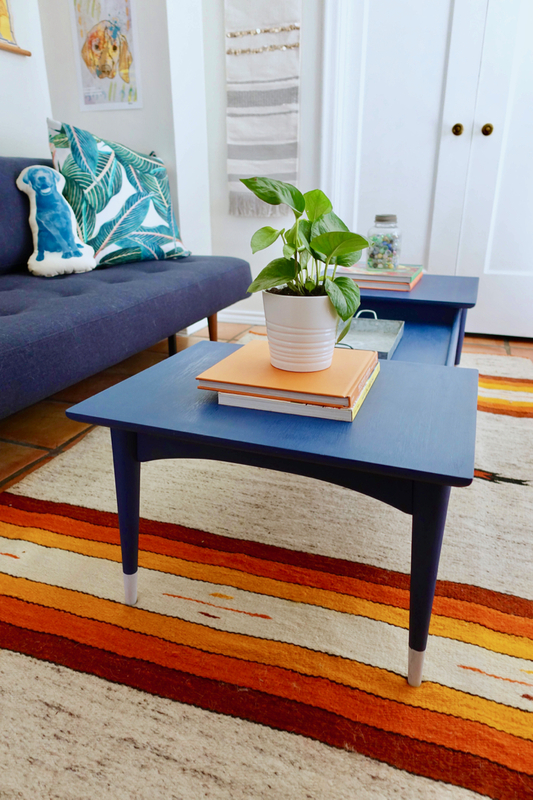 I’m tempted to try this table out in my own living room as we move closer to spring. Currently I have a comfy but cumbersome leather ottoman as my coffee table, and this oval beauty would lighten and brighten the space. Or maybe I’ll just drag the table out by the pool and lounge, drinking rosé, legs dangling in the water.